5pc Innokin iClear 10 Single Coil Clearomizer is the replacement cartomizer of iTaste EP kit and coil unit is unchangeable. It comes with 510 thread, 1.0ml capicity, 1.8ohm/ 2.3ohm resistance, 6 colors. Innokin iClear10 510 Clearomizer 1ml is the replacement cartomizer of iTaste EP kit and the coil unit is unchangeable. • Pull out the mouthpiece and fill in no more than 1.0ml e-liquid from the top. Don't fill e-juice in the centrol hole. • Carefully push on the mouthpiece and clear surplus liquid. • Allow 1-2 minutes for the e-juice to feed into the coil before you start to vaping. Or Give the cartomizer a quick shake to make it faster. • Screw onto your battery and start vaping. • It is the same cartomizer from Innokin EP starter kits, it comes with 510 thread, it can work with 510/eGo/eGo-T/eGo-C/eGo Twist battery! • 1.0ml capicity, 1.8ohm/2.3ohm resistance and top filing. • It's a empty cartomizer, it doesn't come with e-juice. 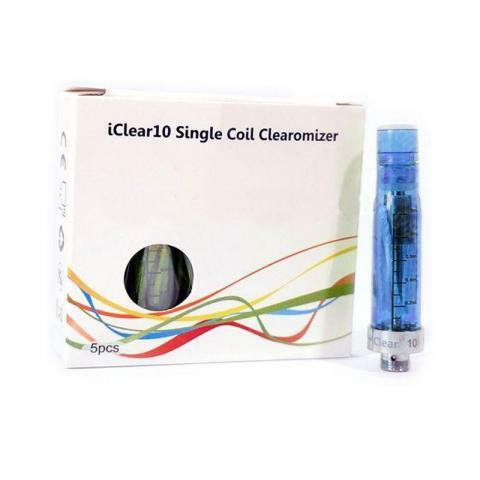 • The coil unit of iClear10 Cartomizer is unchangeable. Innokin iClear10 510 Clearomizer one of the unique cartomizer from Innokin with 5 pieces per pack made of metal with unique base connector. It has a 1ml capacity with 1.8ohm resistance and can be easily refilled.